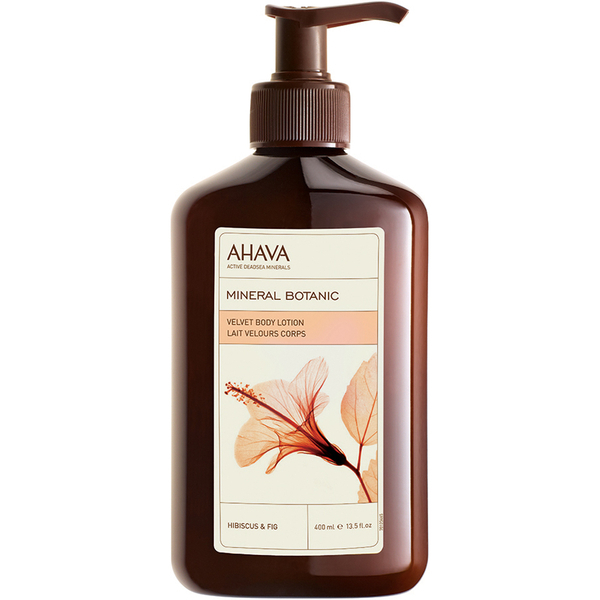 Meet the delicate needs of dry skin with the Hibiscus and Fig fragranced Mineral Botanic Velvet Body Lotion from AHAVA. The luxurious lotion is powered by AHAVA’s Osmoter™ technology, a balanced concentrate of Dead Sea minerals, known to improve skin’s wellbeing and visible youthfulness. Also enriched with Hibiscus and Fig extracts, which smooth and moisturise skin, as well as possessing anti-inflammatory properties. Apply to clean, dry skin after using Mineral Botanic Cream Wash in Hibiscus & Fig. Usage: approximately 1 pump for arms, 1 pump for each leg, and 1-2 pumps for the rest of the body.